This exceptionally well-made cabinet draws on the design of a rustic sideboard found in a country home. It’s built to accommodate smaller spaces yet offers ample storage, including wine cubbies and stemware holders. Crafted of salvaged wood, its natural markings and color variations are enhanced by hand to create the timeworn character that makes each piece one of a kind. 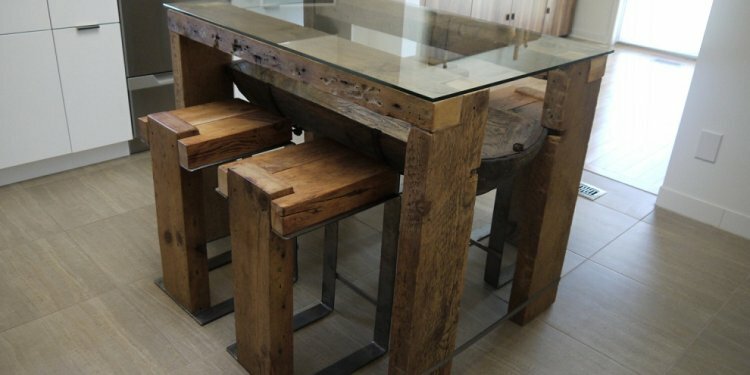 HOW ITS CONSTRUCTED Crafted of reclaimed kiln-dried hand distressed acacia wood. The reclaimed wood features variations inherent to salvaged materials such as a rustic distressed finish, visible nailheads, knots, hairline cracks and oil stains, which may result in hue variations, rubbed edges, or other antique-like characteristics. DETAILS YOU’LL APPRECIATE Hand applied distressed finish. Features removable wine rack. Cabinet securely locks with provided key. KEY PRODUCT POINTS Adjustable levelers ensure stability on uneven surfaces. Dimensions & Care DIMENSIONS Overall: 36" wide x 20" deep x 42" high Top: 36" wide x 20" deep x 1" thick Fixed Shelf: 33.5" wide x 13" deep x 0.5" thick Weight: 193 pounds CARE AND MAINTENANCE Dust often using a soft, dry cloth. Protect from direct sunlight and extreme temperatures. Blot spills immediately with a clean, damp cloth. We do not recommend the use of chemical cleansers, abrasives, furniture polish or wax. Shipping & Return Info SHIPPING In-stock items will usually ship within 7-10 business days for the cities listed below: San Francisco, Los Angeles, Dallas, Chicago, Detroit, Columbus, New York City, Baltimore, Boston, Cromwell, Atlanta, Raleigh, Charlotte, Tampa, Fort Meyers, Orlando, Miami, Fort Lauderdale. For other areas, your items will be delivered within 2-3 weeks. White Glove Delivery With White Glove Delivery, items are brought into your home, most are unpacked and assembled*, and the packaging is removed. White Glove delivery is only available in the contiguous 48 states. Delivery is by appointment Tuesday - Saturday in most major metropolitan areas, with Monday delivery available in some areas. Service to outlying areas may be restricted based on geographic location. Our delivery service will contact you to arrange a delivery date and confirm the appointment timeframe. *Exceptions include outdoor patio structures, marble or stone sink consoles, lighting, mirrors, rugs, headboards attached to a metal frame and any items requiring home installation or wall mounting. Surcharges Select oversized items have an additional delivery and processing surcharge; this charge is listed below the item price. View the complete Shipping and Delivery Information page. HASSLE-FREE RETURNS We take great pride in the quality and craftsmanship of each and every Pottery Barn product and we hope you love your purchase. If for any reason you do not, you have 30 days - or 7 days for all Quick Ship upholstery items - to return your purchase for a full refund or exchange. You can return most non-furniture items to your local Pottery Barn store - FREE. Exceptions Delivery fees are non-refundable and prior purchases are not eligible for a price adjustment. The following items are non-eligible for returns or exchanges: Monogrammed items Mattresses Gift cards Special-order items (including made-to-order upholstery and custom order rugs) Final Sale items (identified by a price ending in $.X7 or $.X9) Items damaged through normal wear and tear. Questions? See our full Returns Policy.